Bangkok (Thailand) – December 10, 2018 (travelindex.com) – Issaya Siamese Club is hosting a special charity dinner and auction in collaboration with some of Bangkok’s most talented chefs on 18 December 2018. The dinner and auction will raise funds for underprivileged children and youth in northern Thailand. The dinner and auction will raise funds for the Chiang Mai-based Child’s Dream Foundation and its Half Day School Programme, which offers vocational and life skills training, medical check-ups, vaccinations, nutritious meals and protection for children and youth who are at risk of trafficking and exploitation. Participating chefs include: Ian Kittichai, Issaya Siamese Club and Masterchef Thailand; Arnaud Dunand Sauthier, Le Normandie; David Thompson; Prin Polsuk; Francesco Lenzi, Lenzi Tuscan Kitchen; Sujira ‘Aom’ Pongmorn, Saawaan; Andrew Martin, Issaya Siamese Club; and Dan Bark, Upstairs at Mikkeller. With no less than five Michelin stars between them, the chefs will each present a dish from their childhood memories made specifically for the charity dinner to highlight Child’s Dream Foundation and its work with underprivileged children and youth in northern Thailand. A fundraising auction will be held during the dinner where guests can place bids on exclusive and bespoke prizes such as a round-trip business class ticket to Paris with Turkish Airlines paired with a lunch at L’Arpege, Alain Passard’s iconic three Michelin-starred restaurant; a picture by Yellow Korner; a Riedel wine decanter; and stays at five-star resorts in Thailand and abroad. The event will be held on Tuesday 18th December 2018 at Issaya Siamese Club. The price per person is 9,500 net including wines. 100% of ticket sales and auction proceeds will go to Child’s Dream Foundation. Tickets are available for sale by calling 02 672 9040. 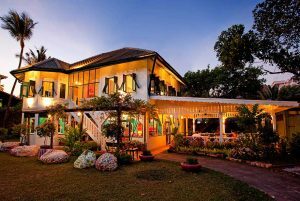 Bangkok – Issaya Siamese Club which opened on the 15th, December 2011, is the flagship home for internationally renowned Chef Ian Kittichai. Chef Kittichai teamed with Frederic Meyer, the founder and owner of the international music management firm Avril Production, to create a concept that incorporates Chef Kittichai’s Thai cuisine and style with a relaxed atmosphere of dining and lounge with a stylish garden party vibe – all in an historical 100-year-old Thai villa and its tropical gardens in central Bangkok. The concept and cuisine is certain to excite sensibilities that crave delicious Thai dishes, artful unique ambience, and exceptional experiences. Issaya Siamese Club is honored to featured, and to be highly ranked on the Top 25 Restaurants Bangkok, the Mastercard Affluent Dining Guide. Child’s Dream Foundation’s Half Day School Programme. Based in Chiang Rai province, the Half Day School Programme offers vocational and life skills training, medical check-ups, vaccinations, nutritious meals and protection for children who are at risk of child trafficking and exploitation. The main beneficiaries are children and youth aged between 6-18, ethnic minorities, illegal immigrants and stateless persons.